It’s Day 3 of the Big Sell 30 Day Challenge! We’re inviting everyone to join us and attempt to experience something new in pop culture once a day for 30 days. To help you out, we’ll tweet out and post suggestions here on our website. We’ll be alternating who is giving the Big Sell over the next few weeks as well as featuring Big Sells from some of our favorite fellow podcasters and hopefully from listeners too! Hey y’all! 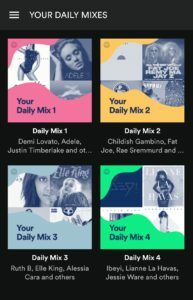 My Big Sell is a new Spotify playlist called Daily Mix. Just these two weekly playlists have introduced us to new artists and also new or re-released tracks from some of our favorite artists and we have been obsessed with both! So, when I opened up my Spotify last week and went into “Your Library” I was greeted by a new category called Your Daily Mix. It was like the Spotify gods were working overtime and said- releasing Discover Weekly on Mondays and Release Radar on Fridays isn’t enough! We need to give the people more! You can see that I have 4 daily mixes and every day, they will change and adapt to what I’m listening to. It’s amazing and I’m excited to see what they do next to read my musical mind! Definitely check out your personalized Daily Mix and find some new music and relive some old classics as well. And don’t forget to let us know what you think of it!! Leave a comment here or tweet us @popinsiders. And also make sure to tell us how your #BigSell30 Challenge is going!